A blend of luxury and innovation, crafted using the most advanced technology for your comfort and with the most luxurious raw materials thus providing the best of both worlds. These world-class sleep systems come with the benfits of pressure reliveing contoured layers to give you optimum ease throughtout the night and help you get the best night's rest. Care Instructions Do not fold the mattress. Rotate the mattress every 3 months. The all-new Coirfit i-Hybrid brings together the unique concept of Innovation + Luxury. Each mattress is a fully packed sleeping system on its own. iCOOLGEL is an advanced sleep surface that’s sensitive to body heat. The temperature sense memory foam adapts to the natural shape of the body while the cooling crystals keep your mattress cool throughout the night. This enables you to dream all night long without any disturbance. This gel induced memory foam mattress is environmental friendly and does not contain any toxic substance that can harm your skin and body. This makes the mattress suitable for all age types. Another special feature of iCOOLGEL is it’s ability to eliminate pressure points. The cool gel infused layer cradles to your body shape thus providing maximum support to your spinal cord. The mattress is developed using i-Contour tech which is a cutting-edge NASA approved technology. It works on the pressure points of the body and relieves body stress with convoluted pressure relievers. The mattress has properties of a memory foam mattress as well as a spring mattress, thus eradicating their flaws. i-COOLGEL is a metal-free mattress but with springy bounce which gives the desired support to your back. Adding to all the advantages of this mattress are the revolutionary seven firmness zones. Each zone conforms individually to the different parts of your body. The shoulder zone is slightly softer as our shoulders stick out more, while the middle zone is slightly firmer as our lumbar area, where the heaviest part of our body rests, needs more support to keep our spine in its natural position during sleep. A firmer middle zone prevents the mattress from sagging and guarantees a longer lifetime of your mattress. These seven zones gives an elastic ability to the mattress which allows it to conform to your body shape to relieve pressure points across the body. It comes with an extensive 11 years warranty and is backed by 31 years of brand confidence offered by COIRFIT. The European Upholstery combined with clima adapt cool-tech fabric cover, rich suede fabric and Turkish accessories complete the look of this mattress. If you are looking for a bed that offer is comfortable and durable, you can't go past i-COOLGEL. Features i-European Upholstery,i-Shape Contour,i-Contour Visco,i-Sense Tech. The all-new Coirfit i-Hybrid brings together the unique concept of Innovation + Luxury. Each mattress is a fully packed sleeping system on its own. Produced using NASA approved i-SENSE Technology, iVISCO is based on aerospace dynamics and has the ability to sense and adapt to the sleeper’s body from head to toe. he 3-zone sleeping system in the mattress adapts to your body’s natural curves and allows your spine to stay in a neutral position. The contoured memory foam layer has wide grooves in the centre and narrow grooves on the sides which maintains the perfect balance for healthy sleep. HR Latex foam, HR soft foam and HR hard foam add to the advantage of the three-zone sleeping system. The mattress is designed with European Clima Adapt and rich suede fabric that has dynamic temperature regulation feature for all seasons comfort. It comes with an extensive 11 years warranty and is backed by 31 years of brand confidence offered by COIRFIT. Styled with Turkish beading and accessories, iVISCO helps in shear reduction, proper air ventilation and unparalleled comfort to your body. The all new Coirfit i-Hybrid brings together the unique concept of Innovation + Luxury. Each mattress is a fully packed sleeping system on its own. iDUAL is a luxurious dual comfort mattress that offers personalized comfort zones to suit your body needs. Bringing the concept of Pneumatic memory foam or in lay man's terms JUMPING MEMORY to India for the first time, iDUAL is the source of ultimate well being and health. It provides perfect bounce to the sleeper’s body. This mattress has been developed after lot of R&D, thus brining in the unique concept of 5 zone sleeping system in Its central core. It responds to your body contours, provides effective pressure and shear reduction to your body. The mattress has 35 vents throughout the mattress which re-enacts the property of a spring mattress and proffers maximum support to the spinal area. The i-countoured HR foam layer imparts better comfort, compliance, durability and pressure redistribution. A bottom layer of Pneumatic HR foam quilt makes this mattress highly resilient and does not form concentrated pressure points, thereby it helps in relieving stress and fatigue. No partner disturbance comes next in line when talking about this mattress. With stunning and contemporary styling, iDUAL is expertly crafted to create a universal feel that appeals to all sleepers. It comes with an extensive 7 years warranty and backed by 31 years of brand confidence offered by COIRFIT. The all-new Coirfit i-Hybrid brings together the unique concept of Innovation + Luxury. Each mattress is a fully packed sleeping system on its own. iLATEX mattress lets you indulge in healthy, organic goodness with a 100% natural layer of Indonesian pincore latex. Revolutionizing the mattress industry, this mattress is one of it’s kind and the most premium natural latex mattress is India. It features a newly developed 5-zone core made from precision contoured HR FOAM. The mattress is a great alternative option for those seeking an “organic” mattress. The 5zone contouring of the core together with the high all-point elasticity of natural latex results in a nuanced and subtle tracing of the body through the mattress, which in turn leads to excellent support of the spine. Adding to the natural benefits of the top latex layer, the lower layers compromises of Pneumatic soft HR and Hard HR foam. Crafted with no motion absorption technology, the mattress limits the movement to its origin which in turn lets you sleep undisturbed even when your partner moves at night. It is best for those who enjoy gentle, quiet support with a little bit of buoyancy. Free of inner-springs, the Five Zone produces a very quiet, lifting experience, while the dense latex foam absorbs motion. The look and feel of the mattress is no less than a sleep heaven. The bamboo fabric cover makes this mattress anti-bacterial, sweat absorbent and maintains a suitable temperature for your mattress. Along with pillow-top cover, luxurious suede, premium knitted handles and Turkish taping, the mattress will impart the perfect plush feeling to your body. It comes with an extensive 11 years warranty and is backed by 31 years of brand confidence offered by COIRFIT. For a lively and luxurious feel, go for iLATEX mattress. Care Instructions Do not fold the mattress. Flip and rotate the mattress every 3 months. The all-new Coirfit i-Hybrid brings together the unique concept of Innovation + Luxury. iSENSE7 is developed using an intelligent science that works on the pressure points of the body and relieves body stress. Derived from NASA’s thermosensitive material for ultimate comfort, the intelligent temperature sense memory foam covering gives a relaxing sleep surface. Bringing the revolutionary concept of Precision contoured Pneumatic HR Foam for the first time in India, the mattress is a fully packed sleeping system on its own. Generally mattresses have soft surface on one side and firm surface on the other side, iSENSE7 features different firmness levels on one single side of the mattress. i-SENSE7 has been purposely designed for your convenience, the mattress offers soft support shoulder and toe region and firmer support to hips and lower back on one single surface so you don’t have to flip the mattress. The seven zone ergonomic design provides optimal body alignment and individual support in every sleeping position. As doctors recommend, maintaining the natural ’S’ curve of the spine is crucial for the body, iSENSE7 helps in guarding this natural shape and truly provides a comfortable night’s sleep. The mattress has six air ducts on each side which help in maintaining the temperature required by the sleeper’s body. The mattress mimics the quality of a spring mattress, yet it is a metal-free mattress and eradicates all the disadvantages of a spring mattress. The European Upholstery combined with removable clima adapt cover, rich suede fabric and Turkish accessories complete the look of this mattress. It comes with an extensive 11 years warranty and is backed by 31 years of brand confidence offered by COIRFIT. If you have aches, pains or body stiffness, i-SENSE7 is the ideal sleeping partner for you. The all new Coirfit i-Hybrid brings together the unique concept of Innovation + Luxury. Each mattress is a fully packed sleeping system on its own. The unique comfort of iLIFE mattress starts with a layer of Precision Contoured HR FOAM Support Cells that provides pressure redistribution, lumbar support and stability to this mattress. The well-distributed Comfort cells make this a Zero Partner Disturbance Mattress, wherein only those comfort cells react which are subjected to body pressure. The unique advantage of this high resilient contour mattress is further combined with Pneumatic HR foam, Orthobond and Firmex Felt layer. 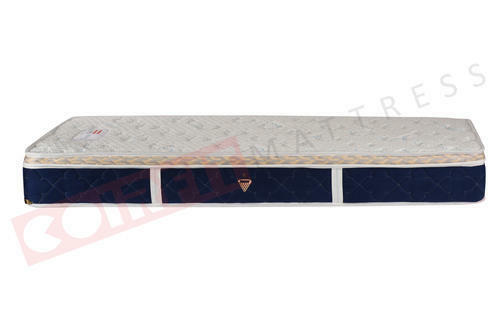 The Pneumatic HR foam provides best in class durability and orthopedic features to this mattress. Orthobond makes this mattress highly resilient and does not form concentrated pressure points; thereby it helps in relieving stress and fatigue. No luxurious mattress is complete without intricately crafted detailing. Wrapped in Premium Melange Yarn Fabric Cover, Track and Jump Quilted Upholstery and Turkish taping, the mattress reaches new height of tenderness. Premium knitted handles, imported eye lids and self quilted knitted side fabric along with 3D air mesh keeps the mattress well ventilated. With stunning and contemporary styling, iLIFE is expertly crafted to create a universal feel that appeals to all sleepers. It comes with an extensive 7 years warranty and is backed by 31 years of brand confidence offered by COIRFIT.